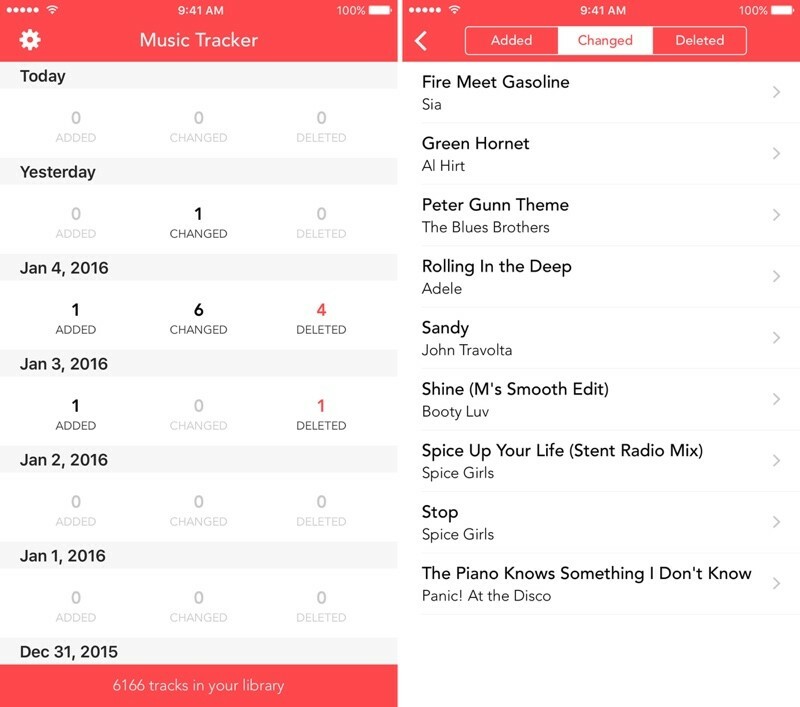 Music Tracker, from developer Ben Dodson, is a new app designed to keep an eye on changes made to the music library on your iOS device. After downloading, the app scans a user's music library and then tracks all changes that are introduced, including new song additions, deletions, and metadata changes to details like the title, artist, album, and genre of owned tracks. Whenever a change is discovered, a notification is sent. While this is useful for those who like to monitor content and changes made manually to a music library to keep personal logs, it's perhaps best suited to Apple Music subscribers. There are instances where content available through the Apple Music service is deleted or changed due to licensing issues with record labels, and this app will allow users to keep track of potential deletions to replace missing music. As an example, Dodson cites a recent change to a studio recording of Billy Joel's "Uptown Girl," which was silently swapped over to a live version on Apple Music. Music Tracker noted the change and Dodson was able to find a replacement studio recording on another album. Music Tracker also includes a full Apple Watch app that provides music library details including exactly how many tracks are in a library and how many songs have been added, changed, or deleted each day. There's also a glance view with the same information and a complication for watch faces that support that feature. During the process of developing Music Tracker, Dodson ran into some potential privacy holes that he feels iOS users should be aware of. With many third-party iOS apps, accessing user information like location, contacts, or photos requires express user permission, but that's not the case with a music library. According to Dodson, apps are able to access a user's music library and send data on what's included back to a server, allowing it to be used for advertising or tracking purposes. An app can scan through an entire music library in mere seconds, gaining information on the music content you prefer, down to details like the song that's most often played. Dodson also believes this could be a way for advertisers and marketers to track users across multiple devices. When iOS first came out there was something called a UDID which basically identified your device uniquely. This was used by marketers to track you across multiple apps and build up a profile. This was stopped by Apple a few years back and replaced with an advertising identifier which you can turn off and which can only be used between apps from the same company (where they are probably already tracking you). However, with a full music library, it would be fairly easy to track someone across multiple apps as periodic snapshots could be compared on a server. Music Tracker, for its part, does not include any in-app purchases, does not require an Internet connection, and does not collect any library data from customers. Dodson says he doesn't know if there are apps that are already collecting music data from customers in the background, but he has filed a bug report with Apple to ask for a permissions feature to be implemented for the music library. Or you can own your own music library and it will never miraculously change itself. iOS 9.3 adds music to the privacy settings. No problem here. I'd love an app like this for the desktop to keep track of my music. I've got 60K songs and when stuff disappears, it takes awhile to notice. I have no intentions of using any app that tracks anything!! Goddamn Pages! Stop saving my freaking documents! How dare Messages and Mail not immediately delete everything the moment it's received! Damn Cut the Rope saving my progress! That's why Snapchat and More Cowbell are the only apps on my iPhone. I used to have Flappy Birds, but it tracked my high scores. Effing brilliant! I very badly want to try iTunes Match but just can't bring myself to pull the trigger, and this may be just the solution. All I hear are horror stories song files being incorrectly substituted. My music collection is incredibly important to me, and already my Apple Music trial alone did horrendous damage to my album covers, inanely swapping manually managed images for irrelevant compilations and movie soundtracks I don't even own. Incredibly frustrating, and inexcusable for a company that operates in apples echelon. I hope to hear good news about this app in the future. iTunes Match is a very tempting service indeed, but if it doesn't work right, it's of no use to me. What I don't like about Apple Music is that I can't play songs from other stores (Germany and Japan, precisely). I thought it was" all the world's music". If this could track when a song from another country is available on my Store/Country, that'd be nice. I didn't get that at all from the article. The developer is letting the world know about these loopholes. His software sounds really useful and he spent a lot of time developing it. We shouldn't admonish him for being the messenger. At this point I'm not sure why Apple doesn't have controls in place for restricting anything personal that an app could access. It's not like this is something a legit app is likely to use, so we won't be pestered much by giving permission. But if many apps start implementing this for tracking then it becomes a problem. I don't mind giving permissions to an app once when I install it. It's much more transparent to tell people exactly what the app can access. Hopefully they are able to roll this control into 9.3. Why is this MR front page material? **SIGH** How many times am I going to have to see this same comment from someone who thinks they should be the managing editor of MR. If I only had a $ for every time someone asked this and had a dozen people explain why it interests them I could be retired.